The study conducted by SMU Geothermal Laboratory, led by Principal Investigator Dr. David Blackwell, incorporated tens of thousands of new thermal data points to create the most data rich perspective on US geothermal resources to date. The full results can be seen in the updated Google Earth layer on U.S. Geothermal Resources and in SMU’s paper to be presented at the Geothermal Resources Council Annual Meeting. The project estimates that Technical Potential for the continental US exceeds 2,980,295 megawatts using Enhanced Geothermal Systems (EGS) and other advanced geothermal technologies such as Low Temperature Hydrothermal. The new estimates are compliant with the new global geothermal mapping protocol developed by SMU, Hot Dry Rocks PTY, GeoWatt Ag, and Google.org which is now recognized by the International Energy Agency and the International Geothermal Association. Under the protocol, Technical Potential is limited to depths of 3.5 to 6.5 km (6.5 to 10 km is considered “Theoretical Potential” under the protocol) and inaccessible zones such as national parks and protected lands are eliminated. The SMU team has been developing entirely new pictures of the earth's geothermal resources. They started by aggregating thousands of new Bottom Hole Temperature (BHT) readings from oil, gas, and water wells in previously under-sampled regions of the U.S. For example, The 2004 Geothermal Map of North America used only 5 heat flow points informing geothermal estimates for West Virginia, compared to the additional 1,455 BHT points in the updated version. In addition, the team has improved estimates of heat flow through the earth's crust with better regional lithologic data. The updated map is a testament to the incredible SMU team: Dr. David Blackwell, Maria Richards, Zachary Frone, Joseph Batir, Ryan Dingwall, Andrés Ruzo, and Mitchell Williams. We’re excited that with improvements in EGS technology, all of these resources could one day be harnessed to provide clean, reliable, baseload power -- energy that’s available every hour of every day. Imagine a renewable energy resource capable of producing more than 10 times the energy of the installed capacity of coal in the US. 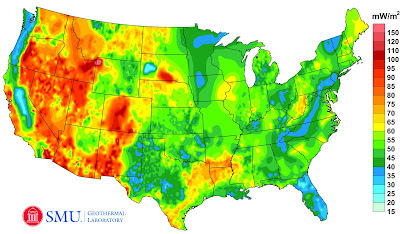 That’s the potential for Geothermal Energy in the United States, according to a recently completed 3-year project supported by Google.org to update the Geothermal Map of North America. As an avid cyclist, I feel very fortunate to live in Boulder, Colorado and be surrounded by over 300 miles of bike lanes, routes and paths. When the weather is cooperating, I try to commute to work every day. It’s a great way to stay healthy and arrive at the office feeling awake! According to Biking Directions in Google Maps, it takes me 10 minutes to travel 2 miles from Point A (my house) to Point B (the office). It also shows three alternative routes, and I can check the weather in Google Maps to see if I’ll need a rain jacket for the ride home. I can also use Biking Directions on my mobile phone, which came in handy for me during a biking trip in Austin when I got lost on a major highway and needed a safe route back to the hotel. Did you know that Google Maps has biking directions available in over 200 US cities and in 9 Canadian regions? A collaboration with Rails to Trails, an organization that converts old railroad tracks into bike paths, has made information about over 12,000 miles of bike paths available to Google Maps users. Millions of people use Google Transit every week, viewing public transit routes on both Google Maps and Google Maps for mobile in over 470 cities around the world. You can take a train from Kyoto to Osaka or find your way around London on the Tube. In some places, you can compare the cost of taking public transit and driving by viewing the calculation below the list of directions (like in this example). Feel free to customize your routes and departure and arrival times under “Show options” to minimize walking or limit the number of transfers. You’ll know if your bus is late by checking out live transit updates. According to the 2011 Urban Mobility Report by Texas Transportation Institute at Texas A&M University, motorists wasted 1.9 billion gallons of fuel last year in the US because of traffic congestion, costing the average commuter an additional $713 in commuting costs. You can save time and money by clicking on the Traffic layer in the top right corner to view real-time traffic conditions on your route, and then drag and adjust your route to green. If you need directions in advance, save paper by sending your directions directly to your car, GPS, or phone. The Send-to-Car feature is available to more than 20 car brands worldwide, and the Send-to-GPS feature is available to more than 10 GPS brands. And for those of you who drive electric vehicles, you can search for electric vehicle charging stations by typing “ev charging station in [your city]” and recharge. As you can see, Google Maps is loaded with features to help you save time, save money, and get where you need to be -- all while minimizing your commute’s impact on the environment. Go green with Google Maps, and safe travels! We’ve learned that most people who use Google Maps just want to get from Point A to Point B -- as quickly and painlessly as possible. Whether it’s planning a weekend bike route, finding the quickest roads during rush hour, or identifying bus paths with the fewest transfers, people are making the most out of Maps features to travel faster and greener. Here’s how you can use Google Maps to minimize your impact on the environment. , a competition challenging independent teams to fly their aircraft 200 miles in less than two hours using the energy equivalent of just 1 gallon of gas per occupant. As we previously announced, we’re sponsoring the Exposition being held today, hosted by NASA at Moffett Field in Mountain View, where the competing aircraft are on display. The awards ceremony just finished and we’re excited to announce the winners. The all-electric Taurus G4 Pipestrel aircraft took home first place, achieving an amazing 403.5 MPGe. The e-Genius team came in second place at 375.8 MPGe, but came out on top for the noise test, winning the Lindberg prize for the quietest aircraft. All of the planes were five to ten times more efficient than standard aircraft. We’ve come a long way from Kitty Hawk! And we’re excited to be part of this next frontier in aviation. This past week has been an exciting time in the history of green aviation. Qualifying teams took part in the 2011 Green Flight Challenge, a competition challenging independent teams to fly their aircraft 200 miles in less than two hours using the energy equivalent of just 1 gallon of gas per occupant. As we previously announced, we’re sponsoring the Exposition being held today, hosted by NASA at Moffett Field in Mountain View, where the competing aircraft are on display.